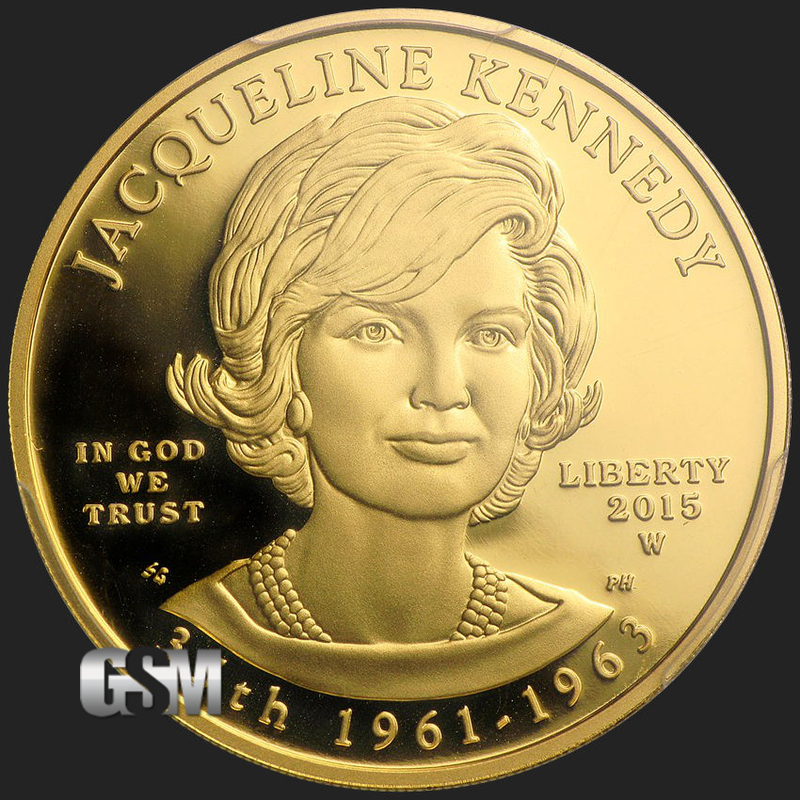 Golden State Mint is excited to offer this beautiful Jaqueline Kennedy coin is part of the First Spouse Gold Coin series. The series, started in 2007 by the U.S Mint, began issuing a ½ oz One Dollar gold coin to honor the spouses of the President of the United States. This tribute would feature, in the order they served, the images of the First Spouses, and would be released to coincide with the release of the corresponding Presidential One Dollar Coin. 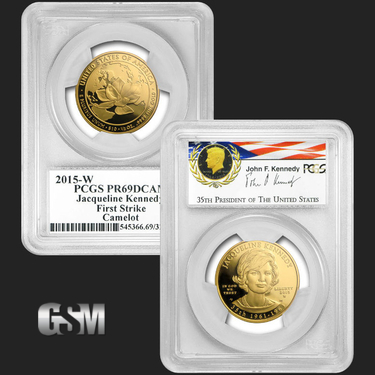 These Jaqueline Kennedy coins are first strike, and minted in 1/2 oz of .9999 fine gold. 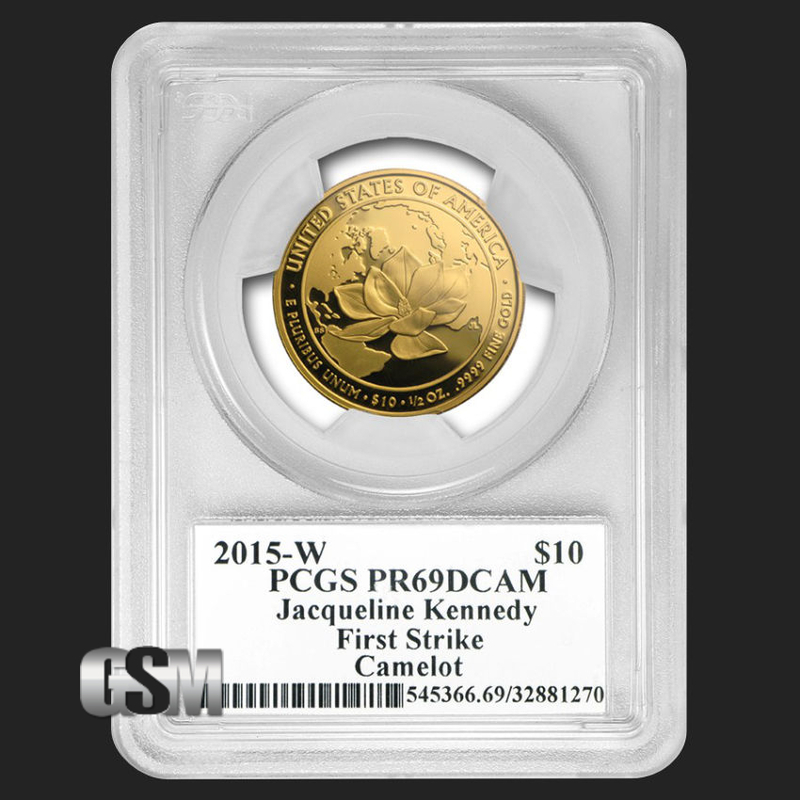 Packaged in a PCGS (Professional Coin Grading Service) encapsulation, with the near-perfect condition designation of PR-69, you get the guarantee that this coin was received by PCGS within the first 30 days of minting. The obvserse (front) of this coin features a detailed bust of Jaqueline Kennedy. Above her head can be found her name, “Jaqueline Kennedy”, while along the bottom is “35th”, which denotes that John F. Kennedy, her husband, was the 35th President to serve, and “1961-1963”, which is the years that were served. To her left can be found “In God We Trust”, and to the right is the word “Liberty” with the coin’s year of production, “2015”, and the “W” mintmark for West Point. 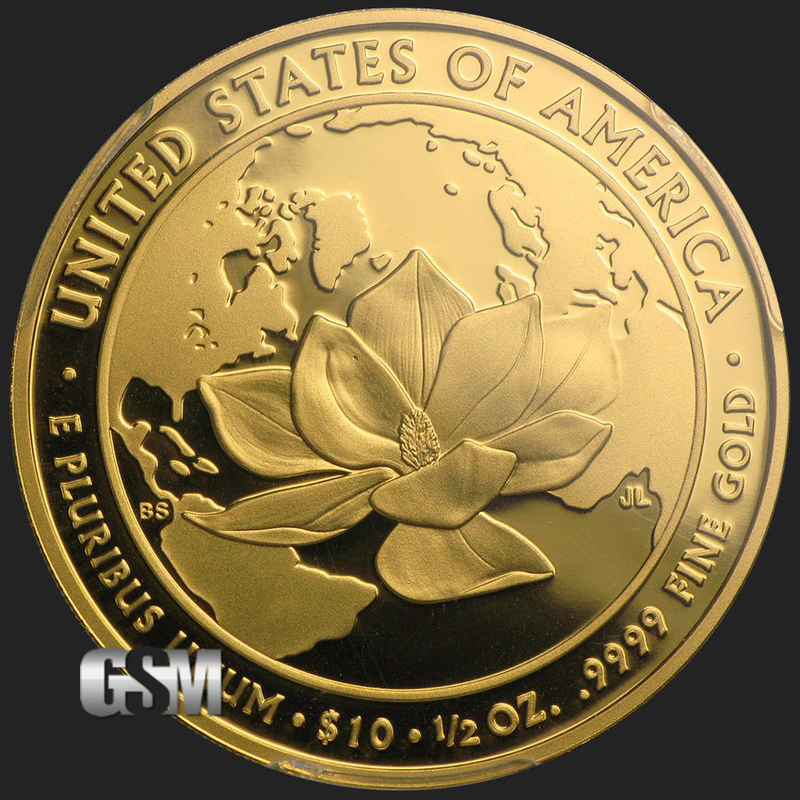 The reverse (back) of the Jaqueline Kennedy First Spouses coin depicts a magnolia flower. The magnolia has very special significance, being the plant Mrs. Kennedy chose to plant at the White House, as well as near the eternal flame at Arlington National Cemetery where J.F.K has been buried. The magnolia appears to stretch across the background of the world, with its petals spanning out, connecting the places where she held some of her most notable diplomatic visits. 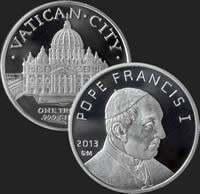 The top of the coin has “United States of America” across the top, with “E Pluribus Unum”, “$10”, and “1/2 oz. .9999 Fine Gold” along the bottom. The Jaqueline Kennedy coin features one of the most loved and iconic First Spouses of the United States of America. 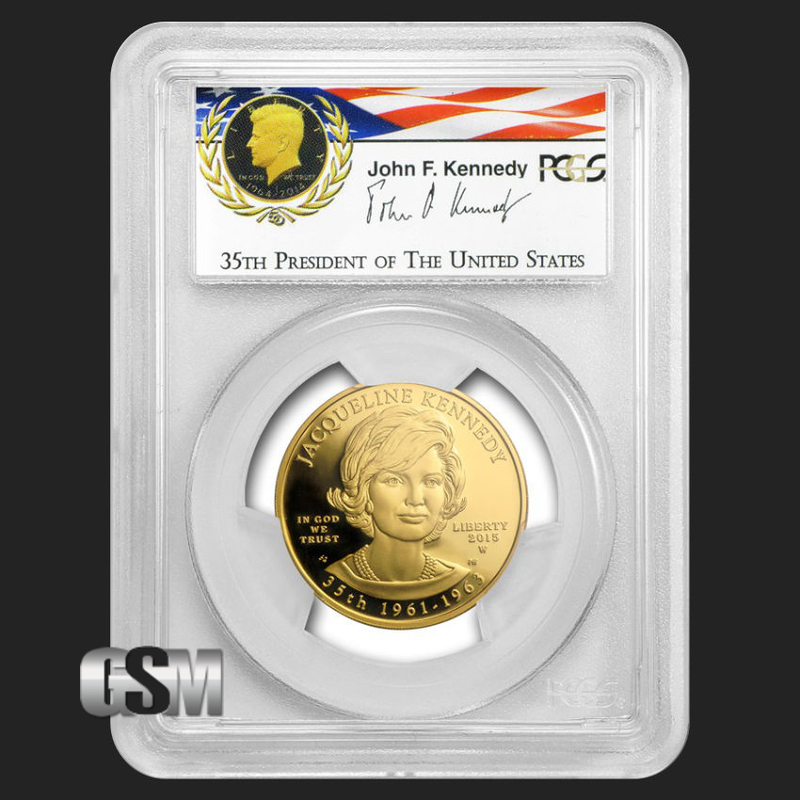 This coin would be perfect to proudly display, to show off the beauty of the coin, and your patriotism towards a woman who was truly a driving force for the nation, and one of the most popular First Ladies. Produced in .9999 fine gold, and IRA eligible, the value of this coin is more than just sentimental. Order yours now through GSM, as supplies are limited. If you liked this product, you should check out our 2009 1 oz Gold Buffalo Proof, 1/2 oz Silver Morgan, and 1 oz Copper Peace Dollar.